Hotel upgrades are usually great when you get them, but what should you do if your hotel upgrade actually equates to a downgrade? Today TPG Contributor Nick Ewen shares a recent experience he had at a Starwood property in Florida, and offers some tips in case you find yourself in similar circumstances. Upgrades can be like a drug to frequent travelers. I often get a jolt of adrenaline when I hear my phone ping in the late afternoon six days before a Delta flight, as it could be the wonderful “You’ve been upgraded” e-mail. Airlines and hotels have made it easier to track upgrades, with up-to-the-minute lists and detailed room reservations that immediately indicate (or even notify you) when you’re bumped to a better seat or room. Unfortunately, access to this information can be a double-edged sword, as I discovered recently. In this post I’ll share my experiences with a recent SPG upgrade and try to answer one question: when is an upgrade actually a downgrade? 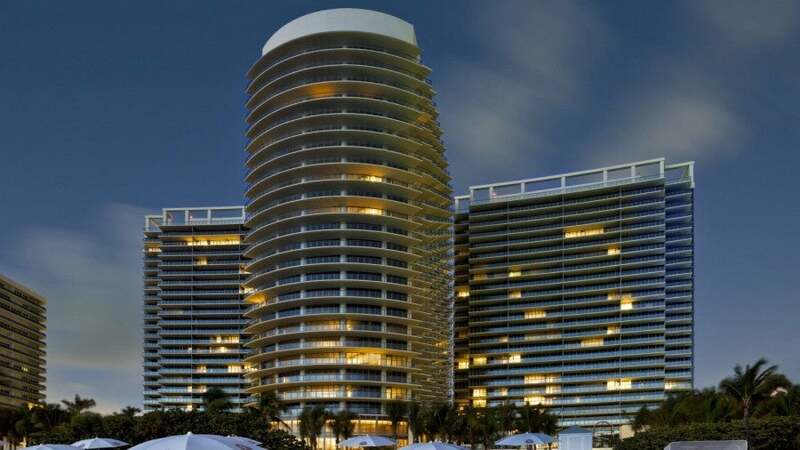 An evening shot of the St. Regis Bal Harbour in South Florida, where my upgrade/downgrade took place. Last month, my wife and I spent a night at the magnificent St. Regis Bal Harbour. TPG reviewed this property back in 2012 (and I’ll be posting my own review soon). Our experience there was enjoyable, but the process leading up to check-in was unusual and a bit confusing. This trip was the first leg of a babymoon (we’re expecting our first child at the end of this month), and I indicated this in the notes when I made the reservation a few months prior. The one-night stay set us back 30,000 points, and we were booked into a standard Deluxe Oceanview Room (which is quite luxurious and spacious at 650 square feet). As a 50-night Platinum member, I also requested to apply a Suite Night Award. These were added to the SPG program as part of it’s overhaul back in 2012, and allow Platinum members to confirm an upgrade into a suite (though it will only be confirmed at most 5 days in advance). This award would bump us up to an Oceanfront Junior Suite, which was slightly more spacious and included a small kitchenette. 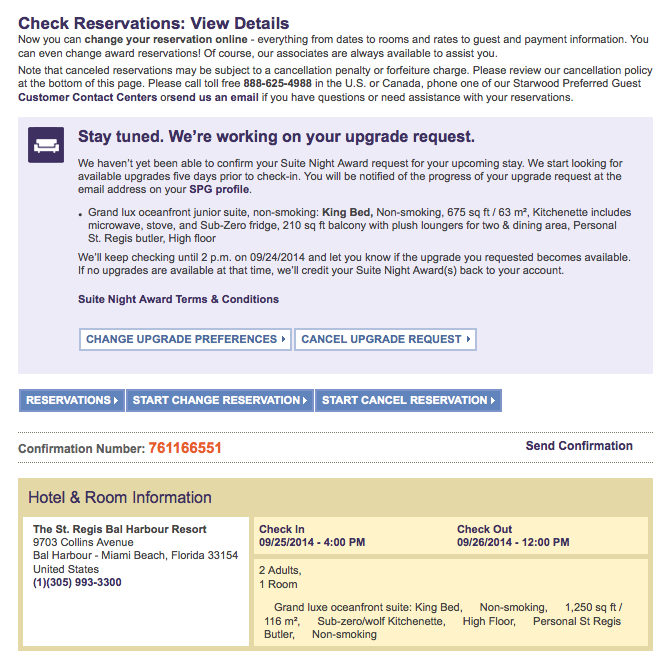 I was hoping that the combination of my note, the Suite Night Award request, and the fact that we were staying on a Thursday night gave us a good chance for the upgrade to clear, as I haven’t had much success using them on award reservations. I was shocked (and ecstatic) to see that we had already been upgraded to a Grand Luxe Oceanfront Suite, which is a full category above the junior suite. Note, however, that the Suite Night Award request for the junior suite was still pending. 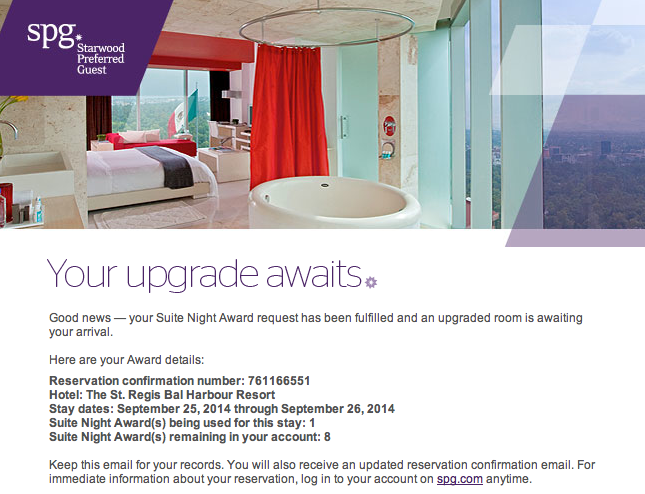 Starwood sent me this message to confirm that my upgrade request had processed. When I logged back into my account, lo and behold, the “upgrade” actually resulted in us being downgraded to the Oceanfront Junior Suite. Fortunately, I had already received a welcome e-mail from Candice Restani, a Guest Recognition Butler at the property. I sent her a quick note asking her to investigate this discrepancy, and within a few hours, she wrote back to confirm that we had been re-upgraded into the Grand Luxe Oceanfront Suite. She even added a note to keep us there! She also apologized for any confusion it caused. Now, I’m not one to throw a fit over anything that isn’t a part of a loyalty program’s published benefits, and I was pleasantly surprised with how easily Candice was able to bump us back up. Had the hotel been full, and had Candice been unable to remedy the situation for us, I would have accepted the junior suite and still enjoyed our stay; it is (after all) a terrific property, even if you’re “stuck” in a mere standard room! But it did get me thinking about how the confusion happened in the first place. Should I have cancelled the request once I had been upgraded ahead of time? And most importantly, could it happen again? SPG has four “lurkers” on FlyerTalk that not only post announcements, but will also answer your questions. To investigate this, I reached out to my fellow FlyerTalkers in the Suite Night Award (SNA) discussion thread. I only came across one other instance of a similar situation in the thread, and in that case, the pre-upgrade stuck, the Suite Night Award was returned, and he/she wound up being upgraded to an even higher category room. I wanted to get the perspectives of other Platinum members, but more importantly, I was hoping that a Starwood Lurker would weigh in. SPG puts other loyalty programs to shame when it comes to engagement on FlyerTalk (ahem, Delta, ahem), and I was interested to hear from the corporate horse’s mouth (so to speak). This is about as unequivocal as it gets. I shouldn’t have been upgraded in advance, and since the Suite Night Award process is automatic, the hotel also couldn’t control the downgrade that took place at the five-day window. 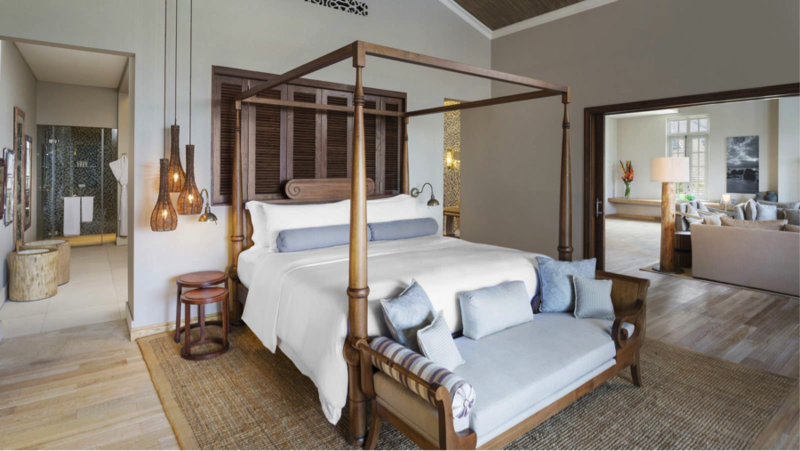 There are several things you can do to maximize your chances at getting (and keeping) an upgrade to a huge room like the Manor House Suite at the St. Regis in Mauritius. Check your reservations a week in advance. I have found that many hotel chains (not just SPG) will process upgrades at least a week ahead of time (especially if you’ve indicated that your stay coincides with a special occasion). If you’ve been upgraded, take a screen shot of the newly confirmed room. A hotel could always take these upgrades back, as you are technically only entitled to the room you booked. However, having “proof” of this upgrade could make the hotel more likely to restore it in case it gets taken away. Consider cancelling your Suite Night Award request. If you do see that you’ve been pre-upgraded (even though this is never supposed to happen, according to the Starwood Lurker on FlyerTalk), consider cancelling your upgrade request. In my case, I essentially “lost” one of my awards, and that could be painful if you plan to apply them to future stays. Keep in mind that hotel inventory can change at any time, and even if you’re upgraded a week in advance, you could then be downgraded before check-in. Be sure to have the contact information for a manager/concierge/ambassador. This was easy for me, as Candice had already e-mailed me when this snafu occurred. For those 100-night SPG Platinum members, you can e-mail your ambassador; otherwise, many hotels have an e-mail address online. If worse come to worst, you can always call and ask to speak to a manager. If you ‘ve been downgraded, be polite and inquire about the situation. They may say that there’s nothing they can do, but it doesn’t hurt to ask! Consider holding onto your Suite Night Awards. If you’re visiting a hotel during low season and it looks like the hotel may be empty during your stay, you may be better off hoping for an upgrade without the award. Since hotels shouldn’t be upgrading reservations in advance with a Suite Night Award attached, you may inadvertently prevent yourself from getting a higher category room than the award would allow. One FlyerTalker in the Suite Night Award thread shared the experience of traveling to Macau with a co-worker and winding up in a small suite with a SNA, while the co-worker was upgraded to a huge suite without one! Your experiences may vary depending on the property, occupancy rates, duration of stay, and numerous other factors. However, keeping these things in mind can help you avoid a frustrating experience, and may improve your chances at snagging that spacious (and sometimes elusive) suite. Have you ever been downgraded after being upgraded? Please share your experiences in the comments below!